IF you are picking your puppy up, please have your remaining balance in Cash or Cashier's check AND please include the appropriate sales tax! WE WILL NOT TAKE PERSONAL CHECKS AT THE TIME OF PICK UP OF YOUR PUPPY! - Mother's Scent Blanket ~ to go home with baby, with mom's scent, to aid in the transition into their new home. 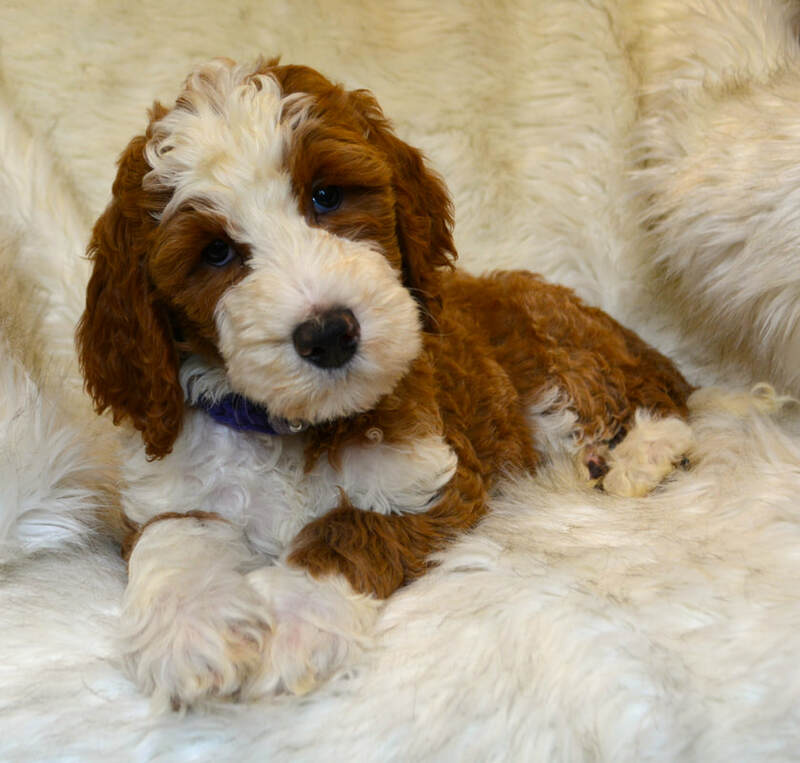 We anticipate Red/ White Parti, Tuxedo, Gold & White Parti doodle puppies! 5. Robert M. & Taylor A. (MA) ~ Orange Ribbon Male "Benson"
8. 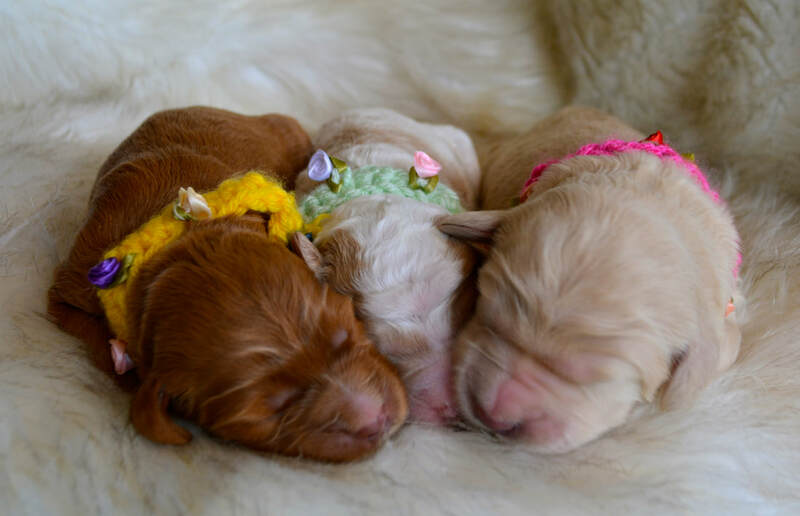 Jim & Joanne G. (MI) ~ Yellow Ribbon Female "Ginger"
Milan's little ones are all doing great. Each baby has gained weight so well, especially as we transitioned to the puppy mush. They tackled that hurtle with vigor. Milan's little doods are now hopping around, playing, vocalizing, tail-wagging and following us around now. They are so much fun! Milan continues to be very attentive to her little ones. She is an AMAZING mama! To date, our little ones have completed the Bio-Sensory Program, they have had their dewclaws removed, they have received their Parvo Vaccinations, their Microchips have been Implanted, had their Second Nail Trims, Second dewormings, their Five-week weight checks, Videos & Personality assessments for Selection Day! Six weeks (4/17/19): Third dewormings, Third Nail Trims and Six-week weight checks. Seven weeks (4/24/19): Veterinary Examinations (Scheduled for 4/25/19), Health Certificates issued, Distemper plus Parvo vaccinations given, Eight week dewormer given throughout the week, Fourth Nail trims & Seven-week weight checks. Ready for their forever homes on May 1st 2019! Our Purple girl is Kind, gentle, but confident. She will melt in your arms, gazes adoring up at you, gives endless kisses and love. She is highly intelligent, very alert and focused for her young age. During personality assessments, she has shown great promise for the Service Canine that we anticipate her to be. She passed ALL of the testing for Service canine potential, with FLYING COLORS!! Her coat is anticipated to be loosely curled, still non-shedding and hypoallergenic. She is a nice blend of both James Bond and Milan, but we expect the larger body stature of mama Milan. We anticipate her to reach approximately 65-70lbs at adulthood. Our Teal boy is perfectly balanced puppy. He is confident, calmer dispositioned and a natural leader. He enjoys our affection, is a playful puppy but has no hesitation in playing independently. He is of high intelligence and handles loud noises and situations that are outside his "normal", with great maturity and confidence. 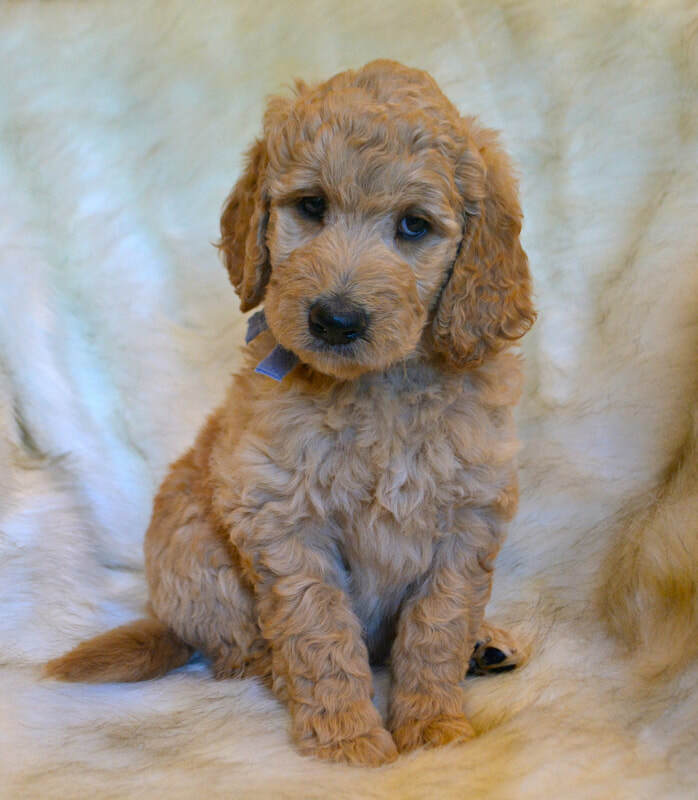 His coat is anticipated to be curly, expected to be non-shedding and hypoallergenic. He is a perfect blend of Milan and James Bond, but is larger statured, like her mama, Milan. We anticipate him to reach approximately 70-75lbs at adulthood. What can I say about this happy girl that just LOVES life! Would could all take a lesson from her. She just loves to love everyone and everything. Sje is a social butterfly. She is fearless, a natural leader and has so much confidence in any situation. She is affectionate, will cuddle in your lap, offering endless kisses and tail wags. She instigates a lot of the play and will demand her litter-mates wake up to play with her, when they are trying to nap. She is always the first to greet us when we come into the nursery and always has a lot to say. Her coat is anticipated to be loosely curled, still expected to be non-shedding and hypoallergenic. She is a perfect blend of Milan and James Bond, but is larger statured, like her mama, Milan. We anticipate her to reach approximately 65-70lbs at adulthood. Our Red boy is as easy going and mellow as they come. He melts in your arms, gazes adoring up at you while laying on his back, so fully trusting of everything. He is very alert, focused and of high intelligence, at a young age. During personality assessments, he has shown great promise for Therapy/Service Canine potential. His coat is anticipated to be curly, non-shedding and hypoallergenic. He is statured more like his mother, Milan. We anticipate him to reach approximately 65-70lbs at adulthood. Our Orange boy is perfectly balanced between calm and play. He enjoys being cuddled and relaxes in our laps, gives endless kisses and tail wags. He can also instigate a lot of the play among his litter-mates. He has a lot of confidence and does not react to loud noises during personality assessments. His coat is anticipated to be loosely curled, still expected to be non-shedding and hypoallergenic. He is statured more like his mama, Milan. We anticipate him to reach approximately 65-70lbs at adulthood. Lavender girl is so very sweet, affectionate, playful and very much a mama's girl. She loves to be held, cuddled and loved on. She can certainly hold her own with those big brothers and sisters though. She is of high intelligence and we look forward to having her as a vital part of our next generation. Our maroon ribbon boy is very nicely balanced boy. He melts in your arms, gazes adoring up at you, gives endless kisses and love. He is very alert and focused for his young age. During personality assessments, he has shown great promise for Therapy/Service Canine potential. His coat is anticipated to be curly, non-shedding and hypoallergenic. He is statured more like his sire, James Bond. We anticipate him to reach approximately 50-60lbs at adulthood. Their babies are Red & White Parti doodles! Eliza & Dino's waiting list has Availability! Eliza's little ones are all doing great. Each baby has been gaining weight by the day! They spend their days nursing and sleeping and not much else, but we are certainly enjoying them. Eliza is as attentive as ever. As a first time mama, she is AMAZING! To date, our little ones are in the midst of the Bio-Sensory Program, they have had their dewclaws removed, had their First Nail Trims, Received their First dewormings, Three-week weight checks, Next Photo Shoot and Videos completed. Four weeks (4/20/19): Second Nail Trims, Second dewormings, Next photo shoot/Videos and four-week weight checks. 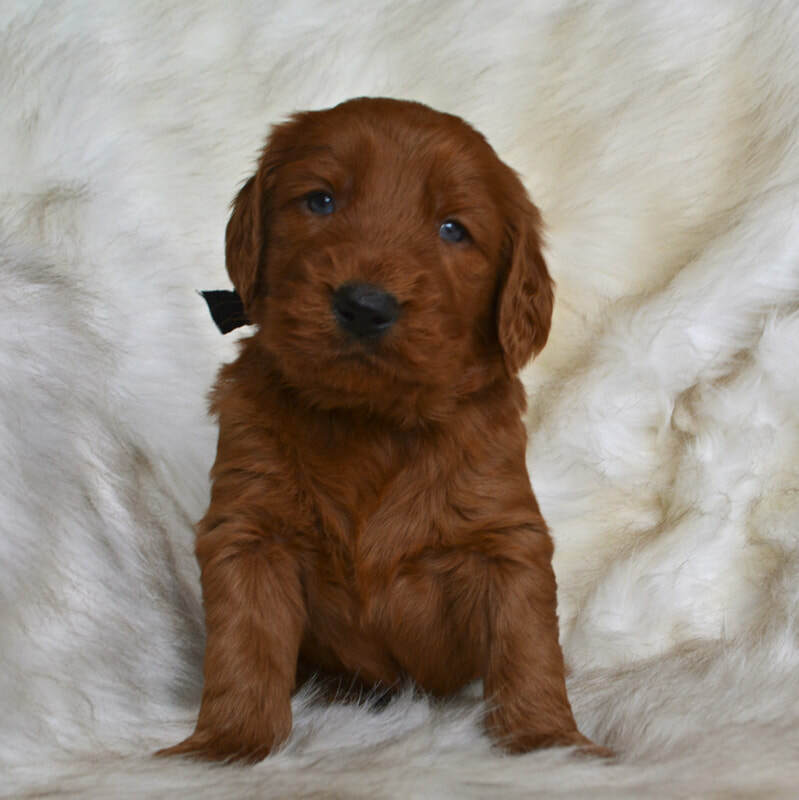 Six weeks (5/3/19): Parvo Vaccinations, Microchip Implantation, Third dewormings, Third Nail Trims,Six-week weight checks, updated pictures, Videos & Personality assessments for Selection Day! Seven weeks (5/11/19): Veterinary Examinations, Health Certificates issued, Distemper plus Parvo vaccinations given, Eight week dewormer given throughout the week, Fourth Nail trims & Seven-week weight checks. Ready for their forever homes on May 18th 2019! 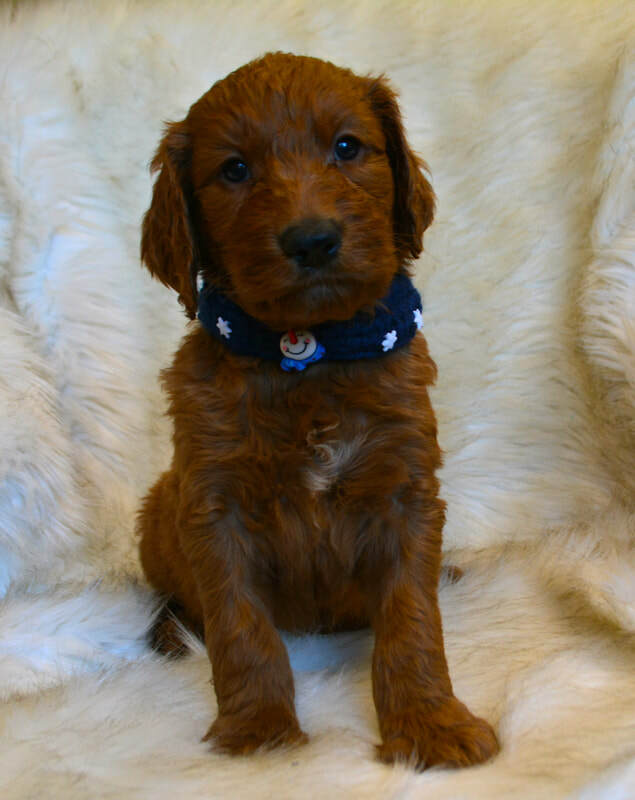 We require a $250 non-refundable deposit to hold one of our puppies or a position on our Litter waiting list. We will contact families in order of our waiting list. 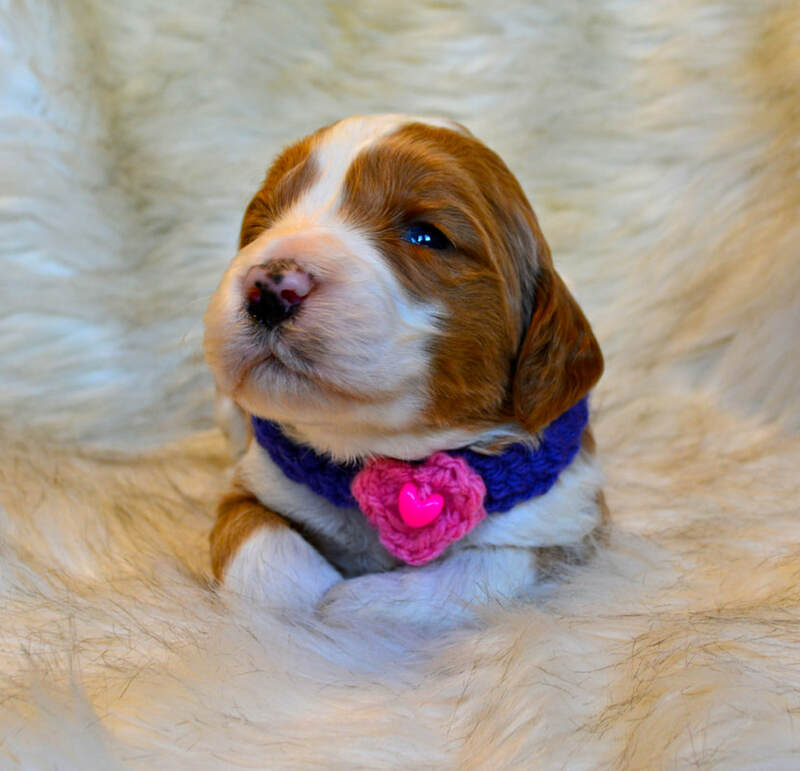 If you would like to continue to wait, we will move you to our next litter's waiting list. The entire balance is due, in cash, at the time our puppies leave to go home with their new families. Please keep in mind that we must charge 6% PA SALES tax on our puppies since we are a licensed Breeder. We always reserve the right to keep one our puppies from a litter without reservation, since they are our babies. 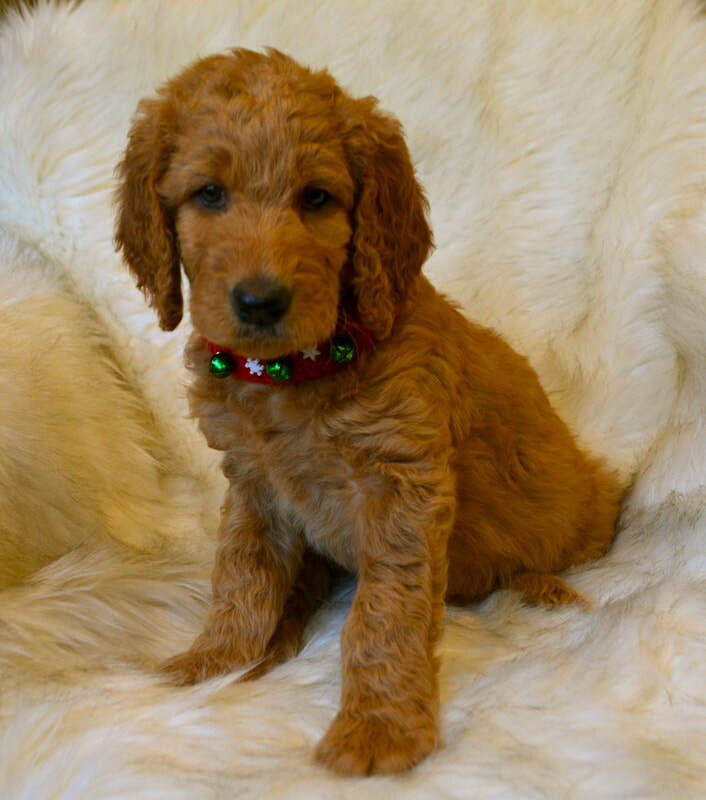 Families that have a puppy from us from a previous litter, have the opportunity to choose a puppy from our litter that will best suit our preexisting puppy in their home. Please keep this in mind.